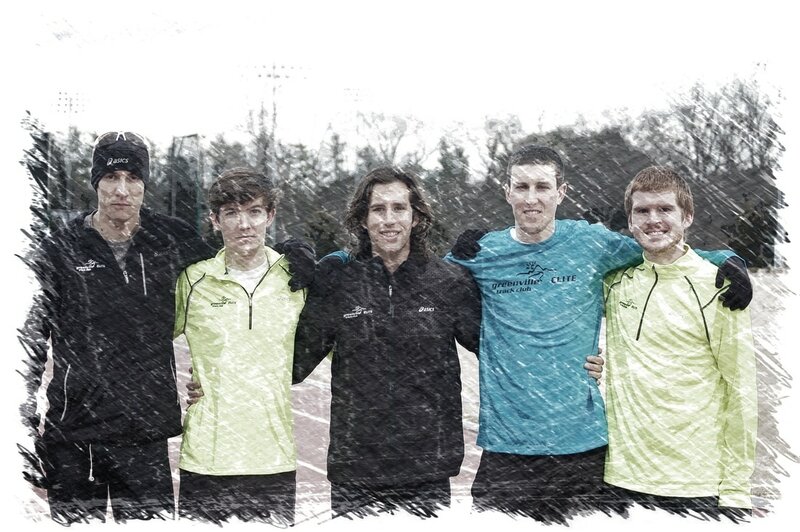 Adam Freudenthal was the initial athlete to join ASICS GTC-ELITE back in August of 2012. The Winthrop University graduate continued to improve and ran personal bests of 14:15 for 5K on the track (Raleigh Relays) and 14:42 on the roads (Greenville News Run Downtown), 23:52 for 8K on the roads, 29:49 for 10K (roads) and 1:08:39 for the Half Marathon (Kiawah Island). Including the Kiawah Island Half Marathon, Adam won eleven races during his tenure with the program and set five course records. Due to personal issues Adam left the program in November of 2014 and returned to his hometown of Spartanburg, SC. 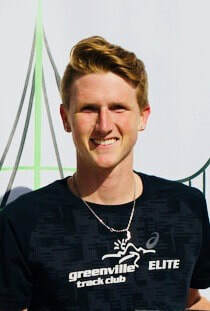 Wallace Campbell (December 2012-December 2013) was the second addition to the post-collegiate, Olympic development program. The Bucknell graduate and grad student at nearby Clemson University completed his Ph.D. in Economics. His dissertation focused on forecasting timber options and he and a partner developed software to aid in the forecasting process. Wallace suffered though a severe case of plantar fasciitis, which basically ended his professional running career. He only ran three races in his brief time with the program, but produced a personal best in the Half Marathon of 1:06:53 at the 2013 USATF National Championships in Duluth, MN. Wallace began his professional work career in early 2014 in Spartanburg, SC and later relocated to Dallas, TX, where he continues to compete in mountain bike racing. ​Josh Cashman was accepted to the program in February 2013 to provide an opportunity for him to achieve the qualifying standards. The High Point University graduate and local running hero ran nine races while a group member, including three victories. He also completed his first Half Marathon, which he won. After a year, Josh decided that attempting to train and compete at this level while working almost full time and desiring a social life was too much. He resigned and currently works at a running speciality shop in Greenville. ​Chas Armstrong was the fifth athlete to join the program and the first without ties to South Carolina. The graduate of Trinity University in San Antonio, TX relocated to Greenville in May of 2013 to prepare for the USA Half Marathon Championships. He ran 1:06:58 in that race, which was only 12 seconds off his previous personal best. Chas was a great training partner for the others in the program and tied for the win with Adam Freudenthal at the 2013 Michelin 5K. He only remained in Greenville for eleven months before moving to nearby Asheville, NC for personal reasons. Chris Caldwell was the sixth athlete to join ASICS GTC-ELITE. An All Southern Conference performer in cross country, he is a 2012 Furman University graduate in Business Administration. Chris moved back to Greenville in August 2013 after competing in track for Appalachian State University while in their MBA program as a graduate student. He began work with the Greenville Heath System as part of the Adopt An Athlete program. During his 27-month post-collegiate career he placed first in two races and second in four races. He also ran a personal best of 24:46 in placing third at the 2014 South Park Turkey Trot 8K in Charlotte. Chris decided to retire from competition in the fall of 2015. ​Ricky Flynn was the seventh athlete to join ASICS GTC-ELITE and arrived with outstanding credentials. He was a seven-time NCAA DIII All American at Lynchburg College and also the NCAA DIII National Cross Country Champion. He had also run 2:13:44 in placing 12th at the 2012 USA Olympic Marathon Trials in Houston. A prodigious trainer, Ricky struggled to remain healthy for extended periods of time, but did run three separate qualifying performances over the half marathon distance to qualify for the 2016 USA Olympic Marathon Trials in Los Angeles. Those three performances were extremely consistent and were within a six second range: 1:04:50, 1:04:56 and 1:04:50. He also placed 21st at the USA Club XC National Championships in Bethlehem, PA. Following another injury and one that forced him to miss the Los Angeles Olympic Trials, it was mutually agreed by Ricky and his coaches that he should begin to transition to the Triathlon. Already spending a lot of time in the pool and bike during cross training, it was a natural progression for him. ​Blake Wysocki joined the program in May of 2014 after graduating from Shawnee State University in Ohio, where he majored in Exercise Science. Unfortunately Blake did not respond well to the uptick in training intensity and volume and suffered from a couple of lower leg injuries. His post-collegiate running career in Greenville was short-lived as he retired and moved back to Ohio in November of 2014 after a brief six-month venture. Trent Binford-Walsh moved to Greenville in July of 2014 to join the program. A native of Pennsylvania, Trent had attended Lewis & Clark College in Portl​and, OR before graduating from the University of Pittsburgh. With no formal collegiate track experience, he was self-trained and presented unlimited potential. Trent only ran five races in the ASICS GTC-ELITE singlet, but won two of those and finished third twice. He also ran a personal best of 24:03 for 8K in winning the 2014 South Park Turkey Trot in Charlotte. Trent quit the program in December after a disappointing finish at the 2014 USA Club Cross Country Championships in his hometown of Bethlehem, PA. He later moved to the west coast to pursue his dream job of being a park ranger. Brian Graves, a graduate of Appalachian State University, had a brief stay with the program from August to November 2014. He arrived with a lower leg injury and a goal of running the Half Marathon under the qualifying standard of 1:05:00 for the USA Olympic Marathon Trials in 2016. However, the injury never allowed him to join his teammates for their primary workout sessions. Frustrated, Brian resigned and began working in a teaching position at Greenville Tech and also at Clemson University. Nicole DiMercurio was the third female to join the program when she arrived in September of 2014. An NCAA DI regional qualifier in both the 5,000 and 10,000 meters, she had been selected and attended the RRCA's RunPro Camp in Washington, DC. The University of Georgia graduate missed some time due a back injury, but was able to quickly bounce back in the spring/summer of 2015 due to her persistent cross training. She won the LexMed Heart & Sole Women's 5-Miler in a personal best of 27:44 and followed that with a track personal best of 16:17.68 to win the 2015 Music City Distance Carnival in Nashville. Then she ran an outstanding personal best of 34:02 to place second among the non-international women competition at Atlanta's Peachtree road race on July 4, 2015. After running her longest road race of 15K in Orlando, FL, she and her coaches targeted a half marathon to qualify for the 2016 USA Olympic Marathon Trials. Nicole came through with a fine 1:14:37 performance at the Jax Bank Half Marathon in Jacksonville, FL to qualify for the trip to Los Angeles. After starting the Trials Marathon too fast for the very hot conditions, she struggled over the last half of the race, but finished with a time of 2:52:10. Soon after the Marathon Trials, Nicole decided to opt out of her contract and move to Blowing Rock, NC and join her boyfriend at ZAP Fitness. Shawnee Carnett was the fourth female to join the program and the first non-distance athlete. She was a six-time NCAA DII All American at West Virginia's Concord University, where she won the NCAA DII National Championship both Indoor and Outdoor. She brought an 800-meter personal best of 2:06.19 when she arrived in late December of 2014. Due to her late arrival she basically missed the 2015 Indoor season and opened the Outdoor season with a 2:12 performance over 800 meters at the 49er Classic in Charlotte, NC. However, she soon resigned from the program to move back to Virginia where she married her high school sweetheart in the summer of 2015. Dylan Doss joined the program in August 2015 with a goal of qualifying in the 3,000-meter Steeplechase for the 2016 USA Olympic Track & Field Trials in Eugene, OR. The native of West Texas ran for West Texas A&M, where he graduated, and then Angelo State University while earning his M.A. degree. Dylan placed fourth in the 2015 NCAA DII 3,000m Steeplechase with a time of 8:51.37 that earned him All American honors. Missing his close-knit family and Texas roots, his focus changed during the first five months and he proposed to his girlfriend in December and decided to move back to Texas to marry her. Dylan left the program in early January, 2016 and accepted a coaching job at Angelo State University. Chelsi Woodruff graduated from Florida State University in May of 2015 and joined ASICS GTC-ELITE in late August. As a Seminole she earned All ACC honors due to her third place finish at the 2015 ACC Track & Field Championships in the 3000-meter Steeplechase. She brought a personal best of 10:13.69 in that event. She was also a two-time NCAA regional qualifier in the steeple and also earned All South Region honors in cross country (2014). After joining the post-collegiate program she ran a personal best for 5,000 meters of 17:09 to win the Spinx RunFest. In December of 2015, she finished 81st at the USATF Club Cross County National Championships in San Francisco, CA with a time of 21:43 over the 6K route. In the spring of 2016 Chelsi ran a personal best of 4:26.32 to win the 1500 meters at the Seminole Invitational on her collegiate home track in Tallahassee. After not improving in the steeplechase, due to persistent issues with the water jump, she decided to not renew her contract and left the program after June 2016. She then transitioned to a full-time position as a personal trainer with the Greenville YMCA before opening her own gym/studio in downtown Greenville. Ryan Root joined the program after a year as a volunteer coach at the University of Illinois. The graduate of North Central College (IL) and a member of their outstanding distance program, had goals of improving his performance in the marathon. After a lower leg injury hindered his training in the fall of 2016, Ryan had a stellar 2017 campaign. He began with a runner-up finish in the big Greenville New Run Downtown 5K, before running a personal best Columbia, SC's MCG Long Run 15K (47:32) in finishing second. In his next race he placed second for the third consecutive race with a huge personal best of 1:07:03 in the GHS Half Marathon in Greenville. In a rare track appearance he just missed his collegiate PB in the 5,000 meters as he ran 14:37.62 to place third in the 49er Classic at Charlotte University. He then ran a personal best for a road 10K with an excellent 30:48 performance for (you guessed it) second place in the TD Bank Reedy River Run over a hilly route. After placing 19th in the USA 25K Championships in Grand Rapid, MI, Ryan ran a personal best of 2:23:32 to place 22nd in the Grandma's Marathon in Duluth, MN. That knocked over three minutes from his previous PB. Ryan opted out of his contract at the end of June to accept a graduate assistant coaching position at the University of Tulsa. Mark Leininger moved to Greenville after training in Washington, DC following his graduation from American University. He completed his M.A. in the nation's capitol and decided to focus on the 1500 meters distance post-collegiately. However, upon joining ASICS GTC-ELITE, he changed his goal to "qualifying for the USA Olympic Marathon Trials." The coaches developed a plan that would have Mark compete at the USA championships in the 20K and 10-Mile events. They then turned their focus to the Jax Bank Half Marathon in Jacksonville, FL and Mark found success with a 1:04:27 performance (well below the 1:05:00 qualifying standard). Mark followed his coach's advice and started slowly in the trials race in Los Angeles on a very sunny and hot day. He moved up through the field to place 68th overall with a time of 2:28:17. Mark became a fixture on the USA Road Champs circuit and placed 15th at the 2017 USA Half Marathon Championships in Columbus, OH. Mark ran 28 races during his two years with the program and won five of those. Some of the cities Mark traveled to and competed in are: Los Angeles, CA; Minneapolis, MN; New Haven, CT; Northport, NY; Las Vegas, NV; San Francisco, CA; Newport, NJ; Richmond, VA; Jacksonville, FL; Raleigh, NC; Columbus, OH; Knoxville, TN; and Lake Nona, FL. In addition to his Half Marathon he also ran personal bests at 3,000m indoors (8:16.02) and the 10-Mile (48:56). During his time with the program he continued to improve his 10,000 meter track performances and ran his personal best of 29:06.16 at the 2017 Portland Track Festival, which was his final race for ASICS GTC-ELITE. Dylan Hassett joined the post-collegiate program in September of 2015 after a stellar collegiate career at the College of William & Mary. She competed in three NCAA Cross Country championships and was a three-time qualifier in the 10,000 meters on the track and once at 5,000 meters. After adjusting to GTC-ELITE's training program, Dylan ran the longest race of her career and placed second in the Lake Nona 15K in Florida with a time of 53:07. She finished the fall season with an excellent 15th place finish at the 2016 USATF Club Cross Country Championships in San Francisco. Following her coaches plan, she ventured up to the 13.1-mile distance in the Jax Bank Half Marathon in Jacksonville, FL and qualified for the USA Olympic Marathon Trials with an excellent time of 1:14:09. Although not having a full training buildup for the Marathon Trials, she finished with a time of 2:57:46 on a very hot day in Los Angeles. Two months later, she was able to win the 2016 TD Bank Reedy River Run 10K in Greenville with a time of 35:01 over the difficult course. On the track, she improved her 10,000 best by 23 seconds with a 34:03 performance at the Portland Track Festival. She ran 34:37 to place 15th at the 2016 USA Women's 10K Championships in Boston, before running her road personal best of 34:29 for second place in Lake Nona, FL. After running 1:16:03 for the Richmond Half Marathon (4th place) she set her sights on the 2016 USATF Club XC Championships in Tallahassee. However, she came down with a viral infection before the race and placed 30th. Dylan was plagued with chronic plantar fasciitis (which first occurred during her collegiate career) during the fall and it worsened to the point of taking time off in December ('16) and January ('17). Due to the persistent tenderness in her foot, she only raced once in 2017-- a third place finish in the TD Bank Reedy River Run 10K. She decided to not renew her contract when it expired at the end of June and move on to another training group. Kate Dodds joined the program in January of 2016 after a December '15 graduation from Bloomsburg University of Pennsylvania. She brought NCAA DII All American honors in both cross country and track. She quickly improved her indoor track 3,000-meter personal best with a time of 9:49.36 in winning the UCS Invitational in Winston-Salem, NC. She then improved her outdoor 5,000-meter PB with a victory at the 49er Classic in Charlotte, NC with a time of 16:52.89. In the fall of 2016, she placed 18th at the USA Women's 10K road championships in Boston with a personal best of 34:49. She then ran her first 8K with an impressive time of 27:48 at the VCU Health 8K in Richmond, VA for ninth place. Maybe her most impressive performance was placing 31st at the 2016 USATF National Club Cross Country Championships in Tallahassee, FL, running 20:49 for the 6-kilometer course. Kate resigned from the program in October of 2017 to focus more on her personal life. Tyler Morse graduated from Illinois State University in May 2017 and joined ASICS GTC-ELITE in July. After a mediocre senior collegiate season, he relocated from his home state to Greenville, SC. He quickly showed promise as he placed 12th in a very deep elite field at the Great Cow Harbor 10K in Northport, NY with a time of 31:15 on a difficult course. His next and final race for the program was a victory at the Great GO! St. Louis Halloween 10K in Missouri. His time of 31:11 also earned him $750. Unfortunately, Tyler's tenure was a brief one as he greatly missed his home and family environment. It was mutually decided to release him from his contract agreement at the end of October '17, so that he could return home where he plans to work and continue to run. Kimberly Ruck was the first woman to join ASICS GTC-ELITE. While pursuing her Masters degree at the University of South Carolina, the former Clemson University All American joined the program. A Greenville native and already a long-time member of the Greenville Track Club, Kimberly was a natural fit for the post-collegiate, Olympic development group. During her almost five years with ASICS GTC-ELITE, Ruck traveled to major competitions around the country including the Stanford Invitational in Palo Alto, CA, the Abbott's Dash for the Finish in New York City, the Tuft's Healthcare Women's 10K in Boston, MA, the Great Cow Harbor 10K in Northport, NY, the Raleigh Relays in NC, three USATF Club XC National Championships (Bethlehem, PA, San Francisco, CA and Tallahassee, FL), the Newport 10K in Jersey City, NJ, etc. Kimberly had some outstanding performances including a 33:17 10,000 at Stanford, a 16:19 5,000 at Raleigh, and a 27:11 8K in Columbia, SC. She won a total of 20 races including the 2017 TD Bank Reedy River Run in Greenville. She also set three course records, including her 16:32 at the 2015 Greenville New Run Downtown 5K. In August of 2017, Kimberly became engaged to her long time boyfriend Marty Maloney, was married in June of 2018 and relocated to Chapel Hill, NC. Alison Parris was the second woman to join ASICS GTC-ELITE. She had worked for three years in her home state of Maryland following her 2011 graduation from James Madison University. With the intention of pursuing post-collegiate running once completely healthy after some persistent injuries during her collegiate career, she was selected to attend the RRCA Run Pro Camp, where her interest spiked and she contacted ASICS GTC-ELITE. After her successful interview visit, she relocated to Greenville, SC in May of 2014. During her time with the program Alison competed in almost 40 races and finished among the top five 30 times, including 14 victories and set five course records. She competed in three USATF Club Cross Country Nationals with two top 40 finishes (26th and 33rd). Parris and her teammates placed 8th at those championships in 2015 in San Francisco. She ran personal bests of 16:29 for 5,000 meters, 27:13 for 8K and 35:12 for 10K. She also placed 6th at the 2015 Peachtree Road Race. Alison was employed by ScanSource, Inc. as part of our Adopt An Athlete program. After experiencing a semi-chronic foot injury during the latter part of 2017, Alison decided to make a career change and accepted a full-time employment position in her adopted home of Greenville. Austin Steagall​​ decided to retire from competitive running and racing in January 2019. The Gaffney, SC, native joined the program in July of 2016 following his graduation from the University of Mt. Olive in North Carolina. Steagall earned All America honors while competing for the Trojans and was the 2016 runner-up in the 3,000-meter Steeplechase at the NCAA Division II national championships. During his time with ASICS GTC-ELITE, Austin earned such honors as the 2017 RRCA South Carolina State 10K Champion and 2018 RRCA South Region Road Mile Champion and also placed 21st at the 2017 USATF 5K Road Championships in New York CIty. He won 17 of the 42 competitions he entered and did not lose to another South Carolina runner in the 15 SC road races he ran. Steagall ran personal bests in the Mile - indoor (4:05.94), Road Mile (4:12), 3,000m - indoor (8:04.45), 3,000m Steeplechase (8:50.58), 5,000m - indoor (14:08.68), 5,000m - outdoor (13:58.14), Road 5K (14:14), Road 8K (22:59), Road 10K (30:08) and Half-Marathon (1:08:58). ​He currently works in Greenville, SC.